It's a hot topic, this diversity stuff. Even my evenings with friends can get dominated by the subject - and I'm beginning to think that there may be an unhealthy obsession with this in the workplace, despite my opinion that diversity is critical to success. I spent a day in Oxford this week with some friends, and we talked a lot about this - specifically focussing on perceived sexism both inside and outside the workplace. I say perceived because we found than by engaging those around us to join in the conversation we discovered several different viewpoints. Here's a simplistic one. I feel it's right to hold the door open for a lady - but a short discussion revealed that I'll typically always open the door for the person behind me - regardless of gender. Nothing to do with male/female, just good manners. Not one person we spoke to thought there was anything wrong with giving up a seat on a train for another person who you felt needed it more than you. An elderly gentleman, someone on crutches and yes, in almost all cases the mixed groups around us felt it was OK to give up your seat to a lady. Thankfully 100% agreed that if that lady was pregnant, it was the duty of any passenger (male or female) to give over their seat. We concluded that it was nothing to do with sexism, and all to do with manners. Some people have different values, dependent on upbringing, age and culture. Guess what? It's the same in the workplace - people are people. Everyone is different, and creating a policy conformist playbook, an extremist HR policy, or a fixed target is the wrong way to ensure that diversity is valued. 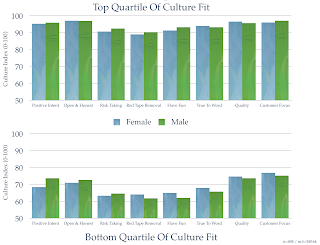 Recently I looked at the perceived culture fit of men vs women. Just over 400 managers were assessed by their teams on a number of behaviours (3500+ respondents). Whilst individuals had dramatically different results, when viewed together the conclusion can only be that people are people regardless of gender (or orientation, or race for that matter). If your company has a high proportion of sexist misogynistic over opinionated dictators, then it's unlikely a policy of diversity inclusion is going to change the underlying environment. The fact remains that appreciating diverse opinion is one of the most effective catalysts for change, and a diverse workforce under good leadership will always succeed in attracting better talent and delivering better results.